New Orleans Celebrates Saints Win As New Beginning In New Orleans, it's a holiday of sorts after the Saints' come-from-behind victory in the Super Bowl on Sunday night in Miami. New Orleans beat Indianapolis 31-17, setting off a celebration in the streets. Some residents see the win as a sign of the city's rebirth after Hurricane Katrina, which devastated parts of the city. Fans celebrate the New Orleans Saints' win against the Indianapolis Colts during Super Bowl XLIV on Bourbon Street in the French Quarter, Sunday in New Orleans. The Saints defeated the Colts 31-17. Down in New Orleans, it's a holiday of sorts after the Saints' victory in the Super Bowl on Sunday night. New Orleans beat Indianapolis 31-17, setting off a celebration in the streets. Some residents see the win as a sign of the city's rebirth. At Ditcharo's, a pub just a few blocks from the Superdome, the champagne corks were flying when it became clear that the Saint's 43-year wait for a championship was over. Patrons of the bar shouted the Saints chant "Who dat baby?" in unison as they celebrated. The bar's owner, Greg Faye, says this football season has been magical. "New Orleans needed it," says Faye. "We have suffered so much since Katrina, and most people don't realize how down this city still is. We've lost so much business and so many residents, but we're still here, and we're still fighting to stay here." But during the weekend, the city was thriving. 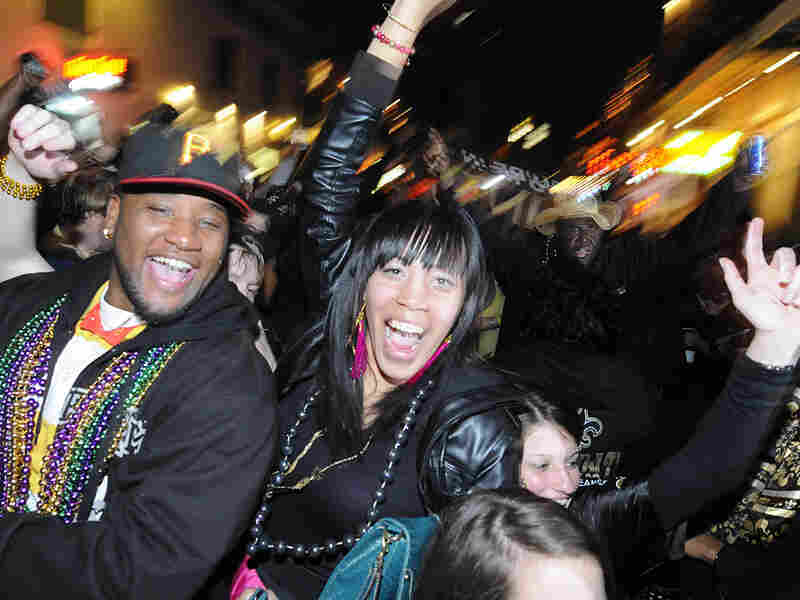 Fans decked out in their black and gold paraded through the French Quarter. They lined up to have their faces painted with the fleur-de-lis. And they gathered Sunday night for a prayer vigil at St. Louis Cathedral, waving signs that read "Bless You Boys." The headline in Monday's Times-Picayune read "Amen!" Sunday night, firefighter Mike Shields and his colleagues were on duty in the Warehouse District, but got to watch most of the game. "It's a dream come true," says Shields. "Words can't describe the way we feel right now." He believes that between the Saints and Saturday's mayoral election, it's a new beginning. "We got something good here," says Shields. "We got the Super Bowl. We got a new mayor. We got a new outlook for the future." Moments after the game ended, people hurried toward the French Quarter for the kind of celebration the city has perfected. Darrell Turner, who lives in the Lower 9th Ward, stood on Poydras Street, and waved a black and gold umbrella at passing traffic. He says the underdog Saints are proof that this city can turn itself around, and is particularly inspired by the possibility of unity among people from different backgrounds. "When everybody come together, you can make something happen," says Turner. "That's what we need in this city — to make something happen!" New Orleans is here to stay, he says.